While summer is the traditional season to give your lawn some much needed TLC, that doesn’t mean you can sit back and relax for the entirety of winter. There are still a surprising number of jobs to be done! – Keep foot traffic to a minimum to avoid causing permanent damage to your grass. Dead, downtrodden grass is particularly prone to discolouration come summer time. – Stop feeding your grass at the risk of speeding up the growing process. Premature grass will be ready for summer conditions and won’t be able to withstand the harsh winter. – Keep rooting out weeds to stop them from firmly establishing themselves. – Constantly remove leaf litter and other debris so as not to smother your grass. – Use aeration to control drainage issues if rain water seems to be pooling. – Keep dragging out that lawnmower (if conditions permit) to stop grass getting long, diseased, thin and less dense. It’s a lot of work and can be hard enough without adding freezing temperatures, high winds and rain to the mix! However, there is an alternative… replacing your lawn with artificial grass. As well as looking beautifully healthy all year round, artificial grass comes with the added bonus of water resistance, and doesn’t require feeding, watering or mowing. This means you can stay snug by the fire on even the calmest of winter days and won’t need to worry about rain damage. 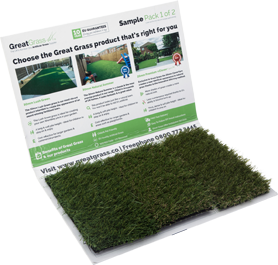 There’s no need to worry about the initial cost of artificial grass either, as here at Great Grass we offer the lowest online prices of any retailer. We even stock a range of grass to suit every budget but which doesn’t compromise on quality, from our lovely ‘Show Garden’ grass to a top of the range ‘Prestige’ grass.